The Mysteries are over! But this website lives on as a resource for for anyone interested in what we did. Newport Pagnell is a town in North Buckinghamshire, England, just outside the New City of Milton Keynes. 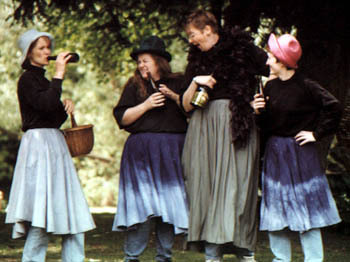 We performed a specially adapted version of the Mysteries there at Easter and In June 2000. At Easter 2000 we performed the trial and crucifixion on Good Friday, and the Ressurrection to the Ascension on Easter Sunday. The whole mystery cycle was performed on both Saturday 24th and Sunday 25th of June 2000. The weather was on our side, except that it got a bit cool on Saturday. On Saturday the biggest audience we had was about 60, but it dwindled towards the end of the day. On Sunday we had at best about 160 in the audience and about 100 stayed with us right to the end of the event. Both performances went well with only a couple of hitches noticeable to the audience in some 8 hours of presentation. Noise was a bit of a problem on Sunday with an air display at Cranfield competing with local motor-cycle racers – but soon we all learned to filter it out. On both days the normal life of Ousebank Gardens went on around (and even among) us, unobtrusively for the most part, with children paddling and fishing in the river behind the setting for some of the scenes. On Saturday an event at the Parish Church lead us to run the Trial scene in Ousebank gardens, but the change of plan worked well: on Sunday we reverted to the original plan and processed through the wonderfully atmospheric old cemetery to the East end of the Church for the trial. On both days the crucifixion scenes were played as planned in the car park behind the United Reformed Church, with road closures enabling us to process both to and from “Calvary”. The audiences on both days were most appreciative and enjoyed not just the play, but the home-baked refreshments provided at Brooklands Club. What follows is as it was originally put on-line – the editor has NOT gone through the text putting it all into the past tense. The Mysteries for Newport Pagnell project aims to offer the enjoyment, excitement and inspiration of the mystery plays during 2000, in public, with free access to anyone who wants to watch, be it for ten minutes or for all three hours (current estimate!). The script takes “The Mysteries at Canterbury Cathedral” (by Kenneth Pickering, Kevin Wood, Philip Dart and Shirley Bennetts) as a starting point. This is a modern compilation of texts from several traditional sources: we have edited this down and further modernising the language to avoid problems of comprehension. We have added our own material to provide additional links between the scenes and to add some scenes (based on original sources). The result will be – in the traditional manner – an original development of a long heritage. The performers – actors, singers, dancers, musicians… – are local people performing for the love of it: some are very experienced performers who are well known in Newport Pagnell and in neighbouring Milton Keynes: for some this is their third experience of mystery plays in the Milton Keynes area: for others both mystery plays and public performance will be new and exciting experiences. The production uses an “in your face”, street theatre combination of moods, varying from ribald comedy to intense passion: of performance styles varying from spectacle to intimate emotional drama, from slapstick to pageant. The setting is the streets and parks of Newport Pagnell in North Buckinghamshire. The costumes will be mainly accessories added to a neutral base, to convey status and role rather than to emulate any historical period. The producers/directors are Jeremy Cooper and Keith Spence, who have been very active in several local theatre companies. The promoter is The Mysteries for Newport Pagnell Association, specially created for this project. The funding has come from the Milton Keynes Arts Association and from a Millennium Festival Awards for All grant, for both of which we are most grateful. The Newport Pagnell Festival has sponsored our programme. As the performances will be free to anyone to watch, we cannot count on ticket sales!